With the holiday season approaching, it is the time for party and gathering around. It is nice to enjoy a glass of wine, but it is headache to deal with many unfinished bottles after. But with a quality wine bottle stopper you can keep that bottle of wine nice and fresh for future use. 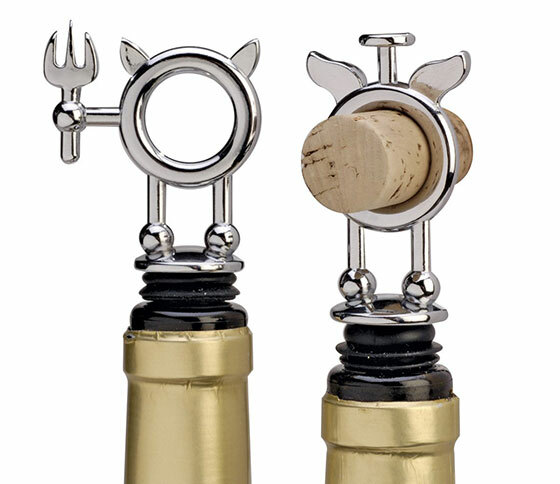 Wine bottle stoppers are available in any of a variety of styles and designs, with a countless number of themes. 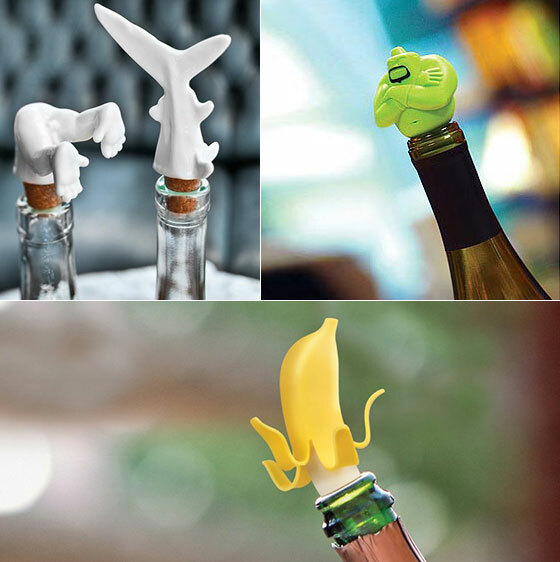 Here, we handpicked 9 Cool and Funny Wine Bottle Stoppers. 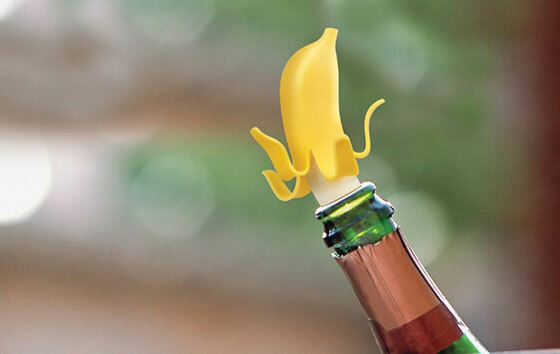 They are not only good for preserving your wine, but also give a nice touch to your open bottle. Enjoy! We all need wine stoppers but if you also need to have a wine stopper that is unique and an instant talking point whenever you bring wine to the table then the Wine Diver Set is for you. Not one but 3 distinctive designs individually presented so you can keep them all or give them to your best mate. Add a Western theme to your oil and wine bottles when you dress them up with a Cowboy Hat Bottle Stopper. 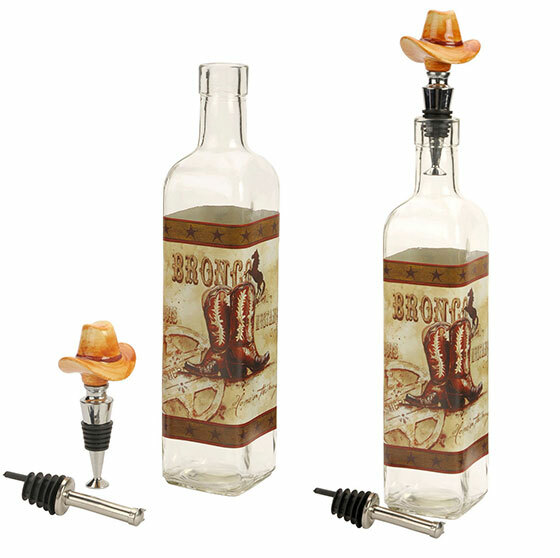 This fun set includes two stoppers, a traditionally styled one for pouring and a ceramic cowboy hat topped one for sealing, plus it includes one glass bottle with cowboy inspired graphics to fill with whatever you like. Wondering how to keep an opened bottle of wine fresh? 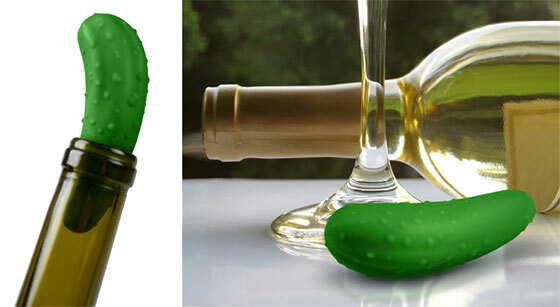 Simply stick a pickle in it with this cool new Pickled Bottle Stopper. Yep, it’s a silicone bottle stopper shaped like a pickle. Pickled is 100 percent food safe silicone. Vintners appreciate the delicateness of mother earth and the importance of keeping her healthy and whole in order to produce good wines. Our greenophile collection of Eco-conscious accessories for everyday entertaining was created with this in mind. Strong and durable, this handy waiter’s corkscrew opens a bottle of wine with ease. 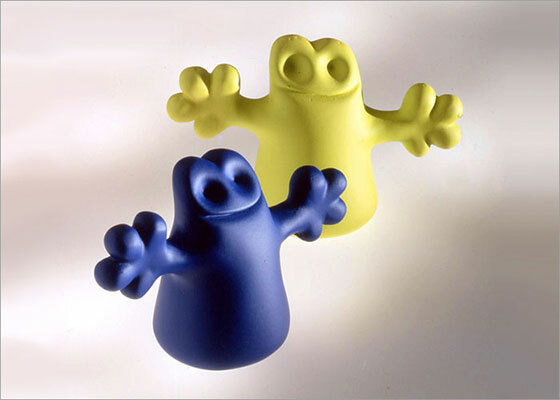 Renowned for applying new, fun designs to everyday household items, Alessi has done it again with these bottle stoppers shaped as little ghosts. 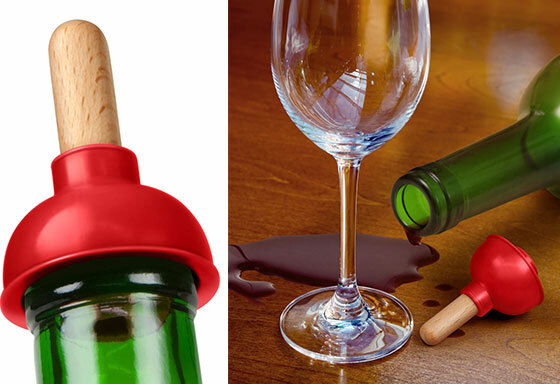 Available in a handy set of 2, in a choice of colors, the bottle stoppers are made from thermoplastic resin. They fit tightly over most glass and plastic bottles. Each measures 1 inch wide by 3 inches long by 2 inches high. 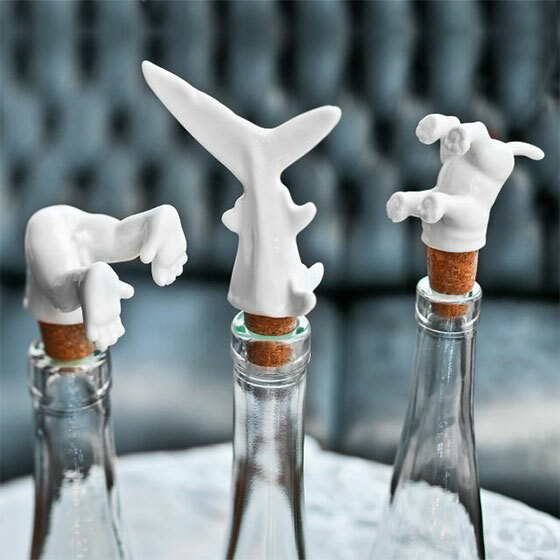 Designed by Mattia di Rosa in 1994, the figure of Carlo the ghost as bottle stopper is sure to delight. Hand wash for care and peruse the full stock of A di Alessi household items to find more fun, like-minded pieces for the home. Oh, how I wish this bottle of magical drink they call ‘wine’ would stay fresh! Well fear not vino lovers, your very own personal genie is hear to grant all your bottle related wishes. Strong and flexible, this genie stands guard keeping your pop from getting stale and fitting to almost any bottle size, ensuring no precious drink ever goes to waste. 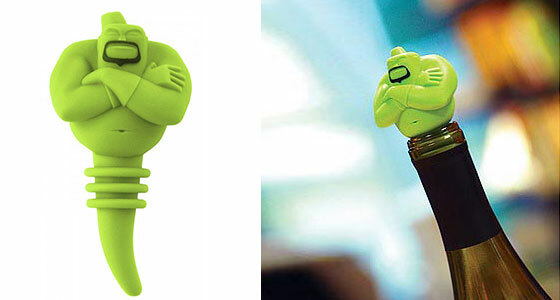 He appears in times of great drink saving need and sits arms crossed in your bottle, warding off any pesky drink thieves.